Once the fermentation process is finished, each fermenter is fully emptied by a wheel loader. The BEKON process generates a dry fermentation residue which means that it is not necessary to separate or press the digestate allowing further compost processing. Part of the material is used for inoculating new biomass and is returned to the cycle. 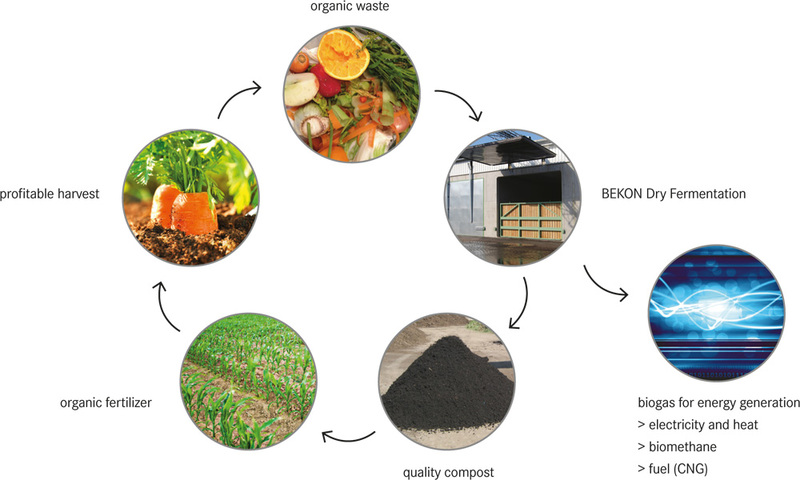 BEKON has developed an enclosed tunnel composting process for treating the dry fermentation residue. The exhaust air emitted by tunnel composting is cleaned using a biofilter, thus avoiding the emission of odours. The final composting stage generally takes the form of windrow composting. The final compost is a valuable organic quality fertiliser used in agriculture and gardening, possibly generating additional revenue. The BEKON process can be operated at both mesophilic (37 – 40°C) and thermophilic (50 – 55°C) temperatures. The thermophilic treatment (50 – 55°C) of biological waste ensures that it is safely sanitized in accordance with the biowaste ordinance. The BEKON process complies with the Animal By-product Regulation (ABPR), the German BioAbfV and the Swiss VTNP. This hygienisation process in the fermenter is not affected by weather influences and there is no need for the standard and time-consuming monitoring of the post-composting phase. The thermophilic microorganisms are characterised by a high metabolism which leads to a biogas yield up to 20 % higher than other technologies. The fast thermophilic process enables a reduction of the retention time in the fermenter, leading to a higher throughput for each fermenter. BEKON´s first thermophilic plant has been operating successfully in Thun (Switzerland) since the end of 2010. This was followed in December 2013 by a second thermophilic plant in Steinfurt (Germany) with an annual capacity of 45,000 tons of source separated waste. The BEKON process is also suitable for all types of bulk or stackable biomass without any preliminary treatment being required.